Update: The August 7th screening is postponed due to rain. There will be free outdoor movies in Surrey every Saturday night in August. 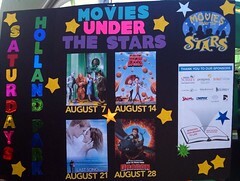 The Downtown Surrey Business Improvement Association will be hosting these evening events at Holland Park and have partnered with the Surrey Library on a theme for the films, “read the book, see the movie”. Bring your lawn chairs and picnic blankets to camp out while refreshments will be available courtesy of a BBQ hosted by the North Surrey Lions Club. I also discovered this weekend that Holland Park has free wifi, in case you’d like to stay connected while you lay out on the grass. Festivities will begin at 4:00pm each Saturday and the movies will start at dusk.